The cinema, whether tacitum or chattersome, fills a need in our lives which no preceding age has ever felt. This need the theatre can never hope to answer, while broadcasting only does so partially and without satisfying our gregarious instincts. There is something formal and ceremonious about going to the theatre. It is an occasion, an event. It implies more careful attire, if not evening dress. We do not say casually “Let’s go to the theatre?” as we say “Let’s go to the pictures?” if only because we are most of us in the habit of booking seats in advance for some particular play. Few of us are indiscriminate enough to sally forth at the last moment to see which theatres have still tickets available. On the other hand we are ready to drop into any old cinema on any old pretext, at any old time, and in any old clothes. 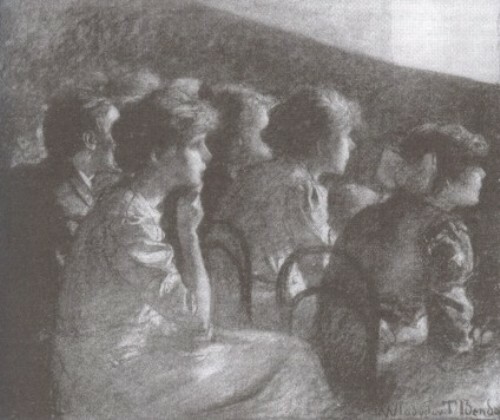 The cinema may, and often does, show eminently “serious,” and so-called “educational,” films – “Young Crocodiles’ Teething Troubles,” “The Life-History of a Cake of Soap,” and what not – but we do not go to the pictures in a serious spirit, or with a thirst for acquiring improving knowledge. On the other hand, grotesquely sentimental or crudely anachronistic films can be openly derided as (in deference to the physical presence of their actors) a bad play can hardly be. The studied decorum, the polite social gathering atmosphere, of the theatre and concert hall are wholly lacking at a spectacle in which the players only appear as photographic shadows of their corporeal selves. The cinema is primarily a sort of public lounge. It is a blend of an English club and a continental café; at once the most public and the most secluded of places. It has affinities with both church and alcove. One can go alone, à deux, en famille, or in bands. One can take one’s children there to keep them quiet; or one can take one’s girl there to be quiet oneself. Punctuality and decorum are of little or no consequence. One can drop in and out at will. In England, though in practically no other country, one can smoke there. One can chew sweets, or peel oranges, or manicure one’s nails. One can proverbially filch ideas for a new dress, or “get off” with one’s neighbour. One can enjoy a little nap as easily as the luxury of a good laugh or a good cry. In wet weather it is an escape from the rain; in winter a means of keeping warm. Sehoolboys, whose holidays are drawing to a close, know that prevalent epidemics can often be caught there. The cinema is a pastime and a distraction, an excuse for not doing something else or sitting listlessly at home. A dinner party misses fire, expected visitors suddenly telephone their inability to come to tea – “What about a cinema?” One had a spare hour or so on one’s hands; just time enough not to be able to do anything else comfortably. So one goes to the nearest picture-house, which is seldom very far away except in the country, and lets a few hundred feet of film unwind before one with casual or rapt attention as the case may be. As a building, therefore, the cinema should be as informal, impersonal and devoid of unnecessary pretensions as a public-house – which is really what it is, alcoholic associations apart. Comments: Philip Morton Shand (1888-1960) was a British architecture critic (and grandfather of Camilla, Duchess of Cornwall). Modern Theatres and Cinemas was his first book and looks at cinemas in a number of countries. The above passage, from a chapter on cinema’s social function, focusses on British cinemas and their audiences. This entry was posted in 1930s, Film books, United Kingdom and tagged Cinemas, Crying, Educational films, Food and drink, P. Morton Shand, Sleep, Smoking. Bookmark the permalink.